My eldest daughter is home from university, having finished her degree. She will be living at home until she graduates (July), meaning that we now need more room. When she left for uni three years ago I erroneously assumed that meant she had left home so I converted her bedroom into a craft/storage room. Having failed to comprehend the vast array of time off uni students have; I then had to relegate her to the fold out lounge for semester breaks, study weeks and holidays. Now she is home for a six month stretch and in need of a space of her own. 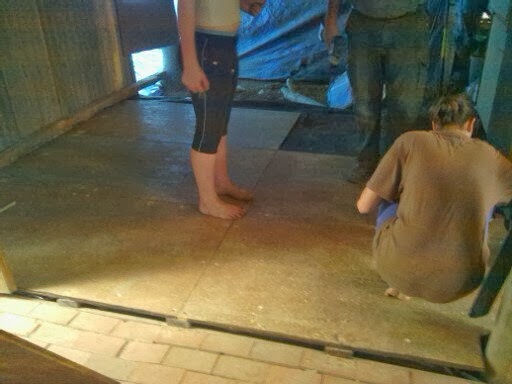 It was decided to build a floor on the inside dirt patch that we always planned to cement (but didn’t) and move the lounge area there so she could have a room with a window next to her sister. 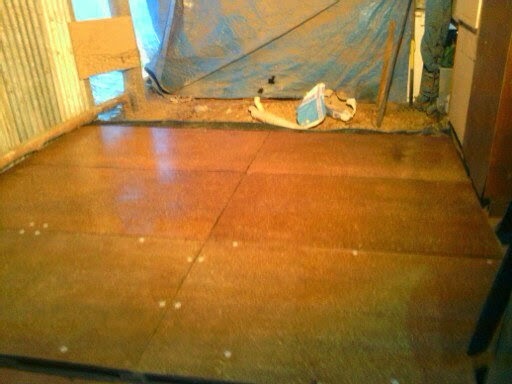 Having looked around for the cheapest option we decided on ‘yellow tongue‘ flooring over a suspended frame of some kind. 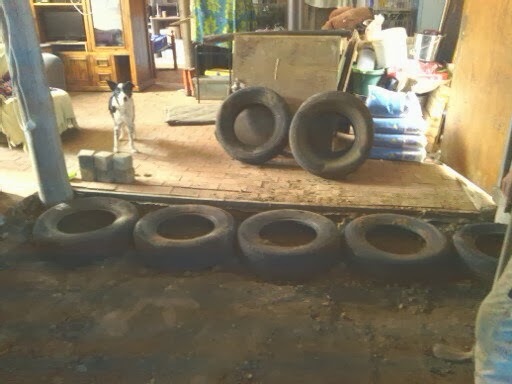 Some research revealed that foundations and piers are often made from old tyres, so it was off to the massive pile of old tyres left at the front of our property by a previous owner. 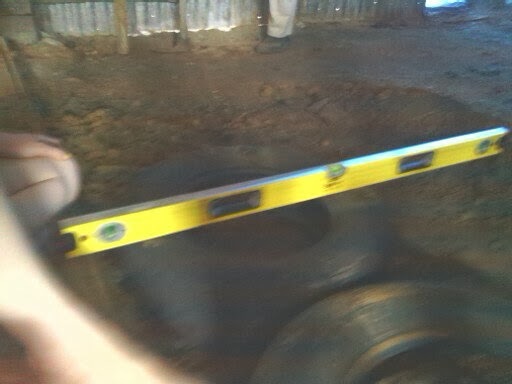 We have been using these tyres for many purposes over the years and we hope to clear the pile by 2020 or so by making them useful. 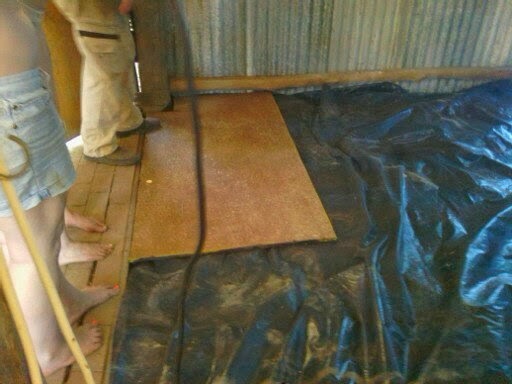 After an expensive trip to Bunnings, we were ready to build….. The yellow tongue ready to be painted. 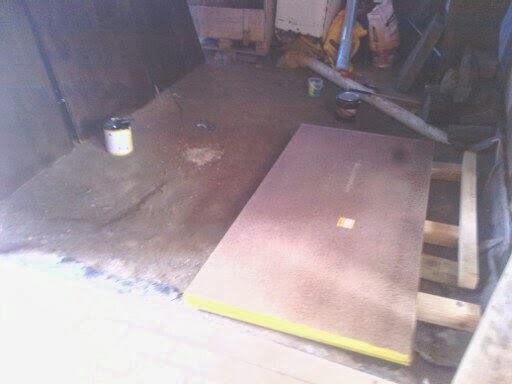 We painted one side with a water proofing paint containing tar. 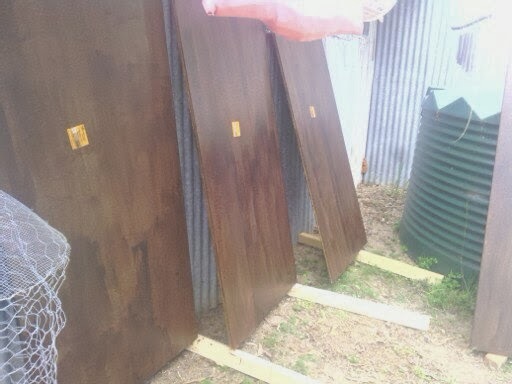 The second coat made them much darker. 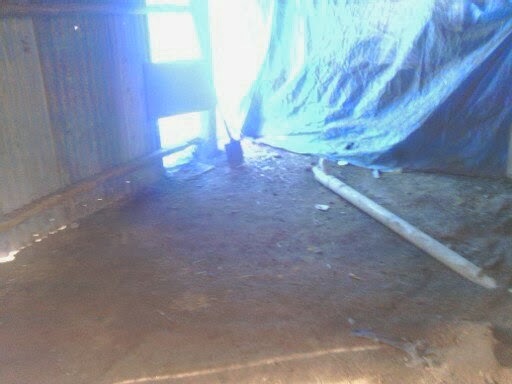 The site of the future lounge room. 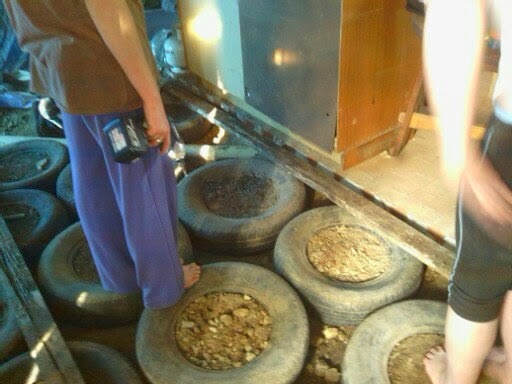 We leveled off the floor and began to lay tyres out. The old dog looked on; confused, as we built. 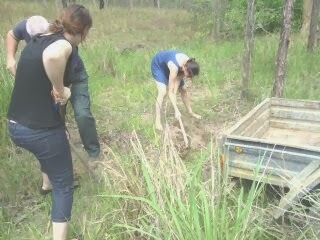 We found a place in the creek where gravel washes into a basin and collected a trailer full. 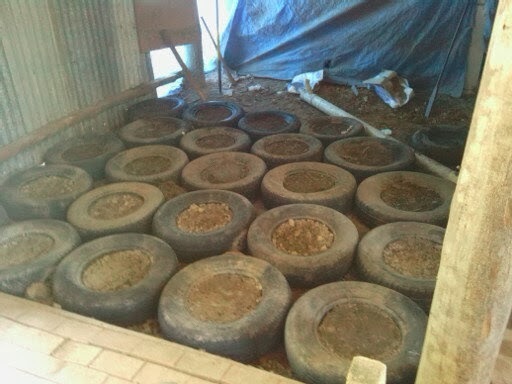 The tyres were filled with gravelly soil mixed with cement and left to set. Black plastic was laid down and the yellow tongue screwed down. 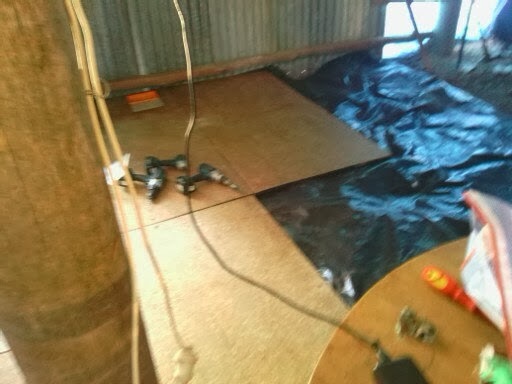 This turned out to be a bit too bouncy for a lounge room floor; so the panels were taken off and we all stood scratching our heads and looking for a solution for a while. 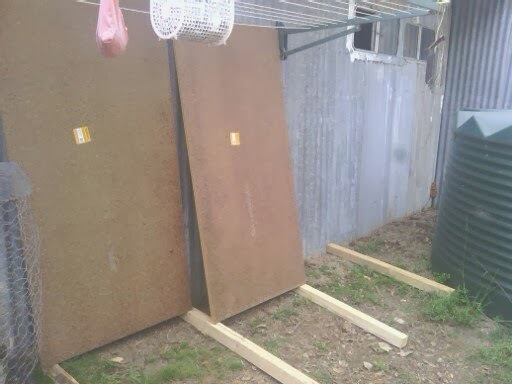 Eventually we got some 4′ X 1′ timber from my parents scrap pile (sorry ‘might be useful one day’ pile) and screwed it down to form a base for the panels. 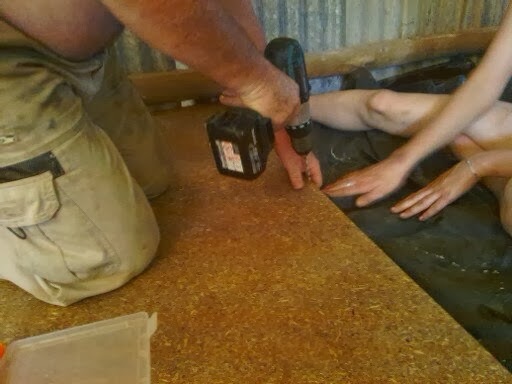 Everyone had a go at the drill. The panels were then screwed down over the black plastic liner (painted side down). And the holes where filled with spak filler. 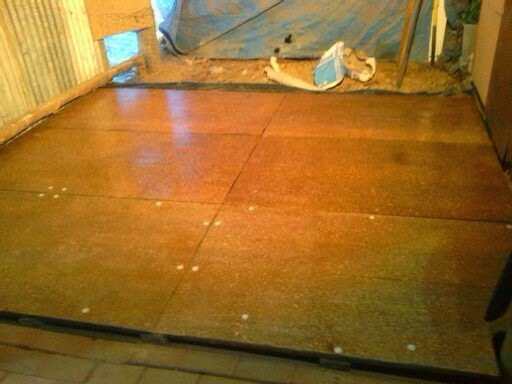 We now have a new lounge room floor and will be lining the ceiling and putting up wiring for lights tomorrow. 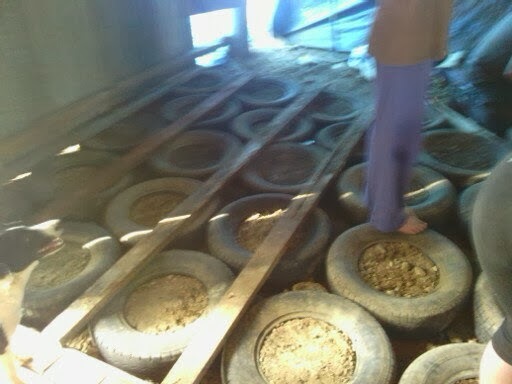 My daughter has room for a bedroom of her own and we have used thirty three tyres from the pile. It looks great and feels good to walk on too. I am thinking of renaming our house ‘the rubbish house’ because we use so much rubbish in the building of it. What do you think of our new floor?? What a fantastic Idea Jude and Kev, though was sitting here thinking I wonder if she is going to fill the tyres with plastic bags!! fantastic can't wait to see the end result!! Thanks Lynn, I can't seem to exactly follow any instructions. I got the origina idea from the video, but I tweaked it to suit what we had and what we wanted to do. Our nest will be empty again by the end of the year, but I am loving having both girls home again (just like the old days). Thanks Shay, it did cross my mind to use the eco bricks inside the tyres. 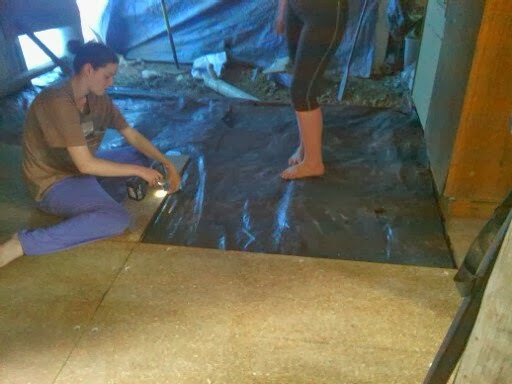 In the end I decided to use the gravel though; I'm saving the eco bricks for building the toilet walls.